Cocoa Pebbles are Gluten Free! 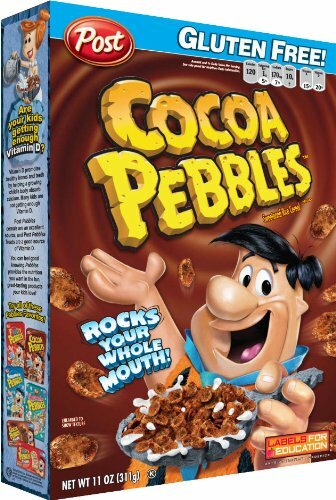 I have had a box of Cocoa Pebbles on my desk for several months now (on my desk, not on my breakfast table) so that I could learn more about the front-of-package labeling scheme. From 20 feet away, my husband saw the cereal box and said, “Wow, Cocoa Pebbles are Gluten Free!” I’d say Post is using a similar strategy to General Mills…. Not to mention the slogan, “Rocks Your Whole Mouth.” Have you seen the commercials? I spent some time yesterday researching the introduction of the first diet sodas. I was surprised to learn that Diet Rite, made by RC Cola, was the first widely marketed soda, followed by Patio by Pepsi, then Tab by Coca Cola. I remember the Tab commercials from the 70s, but just had to share this campaign from the 60s.